Cyclesnack: Red Sky at Morning, Cyclists Take Warning? I don't think this old sailing expression has much merit here in the northeast but that is what the sky looked like this morning when I got up at 5:30 AM. Of course, I went back to bed for 30 minutes because it was just a little too early to pedal to work. I like to leave around 6:30 AM which gets me into the office around 7:15 or so. I found a new route this morning that I like much better because it cuts a big section of Route 6 off from my ride and it's a rolling little back road called Old Bethel Road. The Newtown section is nice and smooth but once you get into Bethel it turns to crap. The new route continues on Walnut Hill and it too is not smooth at all but when I turn on to Ridgedale it's nice and smooth again. 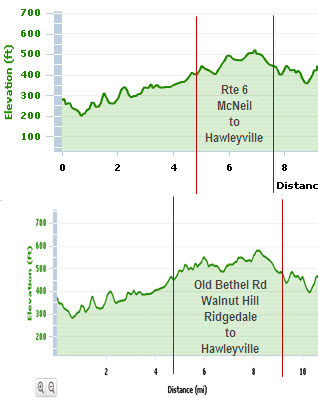 Here is a little comparison of the new route over the old. It's about a mile longer, there is more climbing but it's just little short ups and downs which are really fun on the fixed gear and the route is 5 minutes longer. I can't wait to try it in reverse on the way home tonight. If I can do this 2 times a week, that's 40 miles a week, 160+ miles a month, that's almost an additional 500 miles of riding by the end of the year and I could possibly hit 2000 total miles this year! I am already at 500+ trail miles this year, hopefully I can get another 250 to hit my 750 goal for this year. Next year it will be 1000 trail miles! I keep thinking that I might be the only fixed gear commuter in the Housatonic River Valley Region, that is until I got into work this morning and the manager of the office gym told me there is a guy that wants to get into a fixed gear riding, too. He might be the next convert! Don't forget the saying "rain before 7 sun by 11". I like that one Chris. It rained last night but the roads were fortunately dry this morning.